A recent parent/toddler class was a jarring experience. 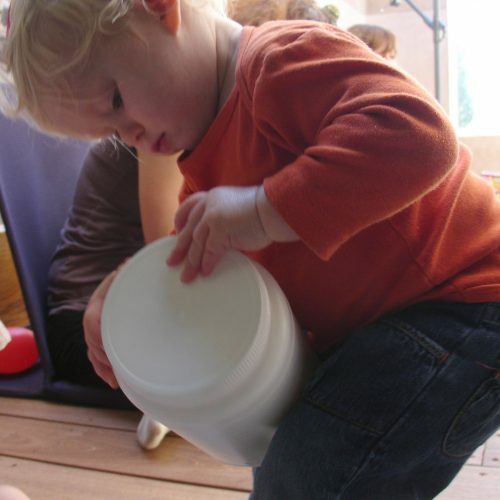 While I was setting up the classroom with simple toys, platforms, climbing structures and objects, I decided to include a large, white plastic jar with a wide screw-on lid. I put several plastic chain links inside the jar and, as I later realized, closed it a bit too tightly. The parents and toddlers started to arrive and I welcomed Jenna, a twenty-month-old girl, accompanied for the first time by her Aunt Lisa. After introductions, the parents settled in and the children began to play. Jenna began bringing objects to her aunt, a common practice by toddlers. Jenna gave Lisa a stuffed dog and Lisa turned it around on her lap to face Jenna. Then Jenna handed Lisa some rings that were hooked together. Lisa took the rings apart for her. Jenna carried over a toy bus and Lisa rolled it on the ground. The pattern of Jenna hauling toys to Lisa continued. And Lisa, wanting to share in the play and show congeniality, responded to each gift of a toy with her own new action. By playing for Jenna, even in this subtle and well-meaning manner, Lisa was making Jenna the audience rather than the actor. It is difficult for adults to see how easily their actions can dominate when they play with a child. When an adult does more than just respond to what a child is doing, the interaction expresses the adult’s interests rather than the child’s. While other toddlers were exploring, Jenna was watching her aunt. I hoped Jenna’s attention would shift during our time of quiet observation. I reminded the parents that we would, for ten or fifteen minutes, attempt to empty our minds of expectations and projections and simply observe the children with as much objectivity as possible (a practice taught to me by my mentor Magda Gerber). I added that we should interact with a child if they looked to us to do so, but we should keep our responses minimal so as not to engage the children too much. When caregivers practice this kind of observation, they gain valuable insights into the minds of children. Watching a child who is engrossed in exploring his surroundings, interacting with his peers, and experimenting with activities he designs, can be illuminating, even astonishing. If a picture is worth a thousand words, then a live demonstration is worth a million in the way that it helps us to understand our child and his needs. When Lisa stopped playing with Jenna, and just graciously accepted the objects Jenna presented to her, Jenna began to demonstrate inner-directed exploration. She brought the bus over to a large box filled with balls of all sizes and tested its ability to drive over the bumps inside the box for several minutes. Eventually she moved on to another toy. The next thing that happened nearly made me erupt in laughter. In response to my admonition to Lisa not to open the jar, Jenna turned and gave me a long stare as if in indignant outrage, but it was likely just surprise. She finally looked back at the jar, now in her aunt’s hands, but made no attempt to open it herself. Jenna did not appear to be frustrated. She has two older brothers and may have been accustomed to having others solve problems for her. This was all the more reason why I hoped Jenna would be encouraged to take more initiative. But Jenna’s opportunity to experiment with the jar ended when Emily, a girl who had joined the class recently, walked over to Jenna and seized the jar. Emily carried the jar to her dad, who was in class for his second time; she appeared confident that he would save the day. Before he could act, I said, “You’re asking your dad to open that. I don’t think he can.” Emily’s dad, Jim, looked at me with an uneasy smirk. I shook my head slightly and smiled weakly. I wished I could have made a more honest statement to Emily about her dad’s jar opening abilities, but in my single-minded desire to make Jim resist her request, a little white lie had spilled out. Jim held the jar but did not open it, although I could tell how badly he wanted to do so. At this point, I had asked two adults to go against their instincts when they wanted to help a child, and I found myself in a precarious situation. If this experiment did not have a happy ending, I’d have an entire omelet on my face. But I took solace in noticing that Emily, like Jenna, was not the least bit upset. She seemed perplexed by the strange way the adults were acting, but not discouraged at all. She made an attempt to unscrew the jar while her father held it for her. Then she brought the jar over to me. Emily’s gesture eased my mind, because while I still felt like the villain in the room, I remembered Magda Gerber saying that when a toddler hands you something it is an indication that the child trusts you. “You’re asking me to hold the jar?” I inquired. As I held the jar Emily made another attempt to turn the lid. “You’re trying to open the top. It’s hard to open.” I then discreetly touched the side of the lid that faced me with my thumb, loosening it the teeniest bit. When Emily tried again she was able to slowly unscrew the lid and open the jar. She flashed me a look and I said with a smile, “You opened it.” A few moments later Emily put the lid back on and then opened it on her own again. Children need the opportunity to solve problems on their own. Parents can create rather than deprive children of this opportunity by resisting an automatic impulse to ‘open the jar.’ Yes, it is counter-intuitive to refrain from assisting a child! But when we help a child to do something she might be able to do for herself, we are robbing her of a vital learning experience and ultimately not helping at all. Children see adults as magical and all-powerful. And when we intervene in a child’s every struggle and fix every problem, we reinforce this view. But if parents and caregivers can believe in a child’s capabilities, and if they can let a child work to figure things out and even allow for frustration and “failure”, then the child will show us that she is indeed capable of more than we can imagine. It is fascinating to me, as well, when a child simply sets the jar down and moves on to something else without any discernible distress. “Oh well!” Later in that particular session, the child may try again, or not. A child may return the following week and seek out the moment he enters the room the very same object. What a great lesson for us all! Sometimes, stepping away from the conflict/struggle/problem is exactly the right choice. 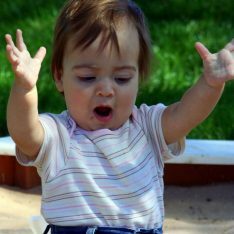 Returning to it later, refreshed and renewed, excited by the challenge to either re-tackle the task or to practice and internalize prior successful efforts, is something children do naturally. Lovely! 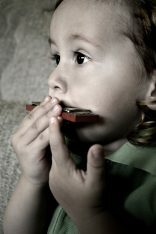 What a gift for a child to see that the world is not made up of “all powerful” adults, but that they themselves have power to make changes…and what a gift to adults to see their children as capable and competent: that children can look first to themselves to solve problems instead of relying on others. I really identify with so many of the parents in the class that you describe. I remember my early experiences with RIE and observing my son. The whole notion that I couldn’t be the one to help him discover all these amazing things was so hard to comprehend….I felt like I deserved the right to enjoy giving those things to him. I’m embarrassed now when I write this – seeing those words – and that I could ever consider it was ever about ME. Ugh. Happily, it became immediately easy and obvious when I saw that “discovery moment” the first time. I think it was something similar to this “Jar-moment” – with another toy that he was trying to open. When he did it himself – the beaming smile, laughter, and exuberance that came from him just melted away my goals – and I just relished in his happiness and pride. I learned in that moment that I could look forward to enjoying more of those moments. This was a great article. My only problem is that the more I read your articles, the more I feel I failed my own daughter who is now 3. I wish I had gone to RIE when she was an infant and read all these articles so much sooner! If I look back on my time with her, over and over I did help her solve problems and showed her how to open jars…etc… Can I undo what has already been done with her? Of course you can! The good news about children is they are extremely adaptable, much more so than we are! So if you are ready to make changes in the way you relate to your daughter, she can easily follow suit. The hard part (for us) is allowing our child to struggle. Magda Gerber always said, “If you can learn to struggle, you can learn to live.” It’s hard for parents to see struggle as the positive thing it is. (I know it was hard for me at first.) If your daughter is not used to struggling, she will probably have an adjustment period and be frustrated when you don’t help as much as you usually do. If you can allow the frustration and just acknowledge it without rushing to fix the problem, she’ll work through it. For example, if she gets upset you might say: “You are working so hard to find the puzzle piece that fits there. I see how frustrated you are.” If she gets too frustrated, let her give up. Trust her to leave problems unsolved — jars un-opened. Let that be totally okay with you. It’s much better left undone than fixed by an adult. If you want to write back with more specifics, I would be happy to try to help. I think it’s brave and wonderful that you want to make changes that will help your daughter feel more capable and self-confident. I feel so grateful to have discovered your blog, and Magda Gerber’s philosophies through it. I am hooked, and have been enjoying going through your posts to understand more about this calm, respectful, caring way of raising my child. Which leads me to a question about babysitters: I work part-time from home, and my mother-in-law, in her sixties, has graciously watched my 14-month-old son since he was 6 months old while I work. Her style of interacting seems to be the opposite of what RIE encourages – she “teaches” how to play with toys, aids w/ difficult situations (shape sorters, legos, building blocks…) and is incapable, despite many requests from me and my husband, to let our son be frustrated and figure things out on his own. I am concerned that she is undoing the curiosity and independence that we try to instill by allowing our son to play and discover on his own, while we remain available, by his side. My husband thinks that it’s important for our son to have different types of interactions with different caregivers. I say the more opportunity for him to lead and explore, without adult instruction, the better. 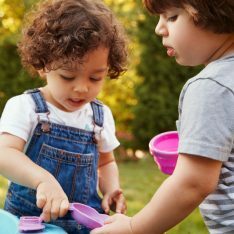 What are your thoughts on guiding grandmother to stop interfering with play? Or am I overreacting? Aralena, thank you for this, and I apologize! You must have left this comment during a busy time and it slipped by me… I hope it’s not too late to respond. The way I see it, you and your husband both have valid points. It’s true that the more time your son has to lead play, the better. But it is also healthy for him to form attachments with others, and he can adapt to a couple of different types of care. If I were you, I would talk your mother-in-law casually, not in a confrontational way, about the discoveries you’ve made as a parent. I would share about the times you observed your son figuring out things on his own that you never would have thought possible, and the look of pride on his face. I’d tell her about the new and unusual formations he created with blocks and how much fun you had when you stifled your urge to help him and just waited and watched. Make up stories if you have to…but share the good stuff. Share your excitement and enthusiasm, and how you enjoyed being with your boy so much more when you didn’t expend all that energy teaching him how to do things…just getting a big kick out of his choices and his personality. I’d be really interested in your thoughts on the last comment (above mine), too. 😉 Rebecca, thank you for the heads-up! I love this approach to learning. This is how our species is designed to learn. A child, or any person’s need to explore, discover, and solve problems on their own doesn’t go away unless it’s so thoroughly suppressed they are no longer motivated by it. I think it’s important to recognize that the current approach to education, one that’s actually very new in human history, not only opens the jar but also determines which jar can be picked up in the first place. Janet, I was reading your response about the puzzle and like it, but I also wonder about the bonding when u do puzzles together as a family vs the child playing by himself each time. In other words a mixture of both. In this case then if it is a puzzle by self and u have been doing puzzles as a family together how would u recommend handeling the frustration piece if-when they encounter and ask for help? I have just discovered your blog and the RIE philosophy, and find it extremely helpful and enlightening. I think I have been guilty of showing my daughter (22 months now) how to play with specific toys, or build towers, etc. Now a lot of the time she would ask me to help her with things, saying “mommy does this” – some of which she can do on her own, while others maybe not. I try to suggest that she does things herself, or that we do it together (me holding her hand, etc. ), but sometimes she’s adamant that I need to do them for her. I’m wondering what the right approach would be in situations when she’s asking me to do things for her and is persistent about it (getting upset and crying if I don’t). Thank you! I’m also interested in your response to this, Janet! Is it just a “I’m not going to do this for you right now, I want you to try” or is there a better way to do this? I’m having a similar issue with my 22 month old. Pingback: Burka, ko neatver (mazuļi, kas risina problēmas) – Cieni, mīli, tici!